For the fourth time in six seasons the British and Irish handicappers have assessed Kauto Star as the highest rated Jumps horse in training. A figure of 180 achieved by beating Long Run (178) in the William Hill King George VI Chase means that he reclaims his crown from Long Run himself, who topped the rankings last year. 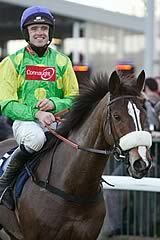 Kauto Star has now been a champion on a remarkable seven occasions, as he was top Two-and-a-half Mile Chaser in both 2006-7 and 2007-8 as well as being top Two Mile Chaser in 2006-7 when he became as yet the only horse to be champion at all three chasing distances. Long Run himself is 10 lbs clear of his nearest contemporaries in the 3 mile-plus Chase division, with Gold Cup winner Synchronised and Grand National winner Neptune Collonges both rated 168. Next season it will be fascinating to see if Long Run can return to the pinnacle of the sport, while last season’s Novice Chasers will be attempting to enter the equation. Flemenstar (163), Sir Des Champs (162) and Bobs Worth (160) all have to improve if they are to reach those lofty levels. Master Minded (174) has been named champion of the Two-and-a-half Mile Chase division for the second consecutive season by virtue of his win in the Amlin 1965 Chase at Ascot where he gave Somersby (165) 4lbs and an easy three length beating. Just like Kauto Star, Master Minded is a versatile as well as outstanding champion as he has also been champion in the Two Mile category twice in the past. Sizing Europe (172) was not quite at his brilliant best this year and as a result lost his Two Mile Champion status to Finian’s Rainbow (173) after a titanic struggle up the Cheltenham hill in March. Both of them will face two new and improving challengers in 2012-13 as Sanctuaire (166) showed his progression as a novice by thrashing older, more experienced Chasers at Sandown in the Bet365.com Celebration Chase by 17 lengths. Such a stunning performance would have seen Sanctuaire crowned top or equal top Novice Chaser in any of the previous 12 seasons but in 2011-12 that title went to Sprinter Sacre (169) who is the most exciting novice the handicappers have assessed since Denman (161) in 2006-7 and Gloria Victis (166) in 1999-2000. The Two Mile Hurdle championship is shared by Rock On Ruby (170) and Hurricane Fly (170). The former was the beneficiary of a brilliant ride by Noel Fehily in the Champion Hurdle where the consistent Overturn (166), beaten just under four lengths, gives the form a solid look. Hurricane Fly gets his rating from the BHP Insurance Irish Champion Hurdle at Leopardstown where he beat Oscars Well (162) by virtually the same distance as Rock On Ruby did at Cheltenham. Grumeti (153) is the first juvenile since Katchit (159 in 2006-07) to be top Two Mile Novice Hurdler, so it will be intriguing to see if he can replicate Katchit’s win in the Champion Hurdle in 2013. It will take nearly a stone of improvement to do so as Katchit performed to 166 in 2008 when winning a sub-standard renewal of the race. For the fourth consecutive year Big Buck’s (174) is the best Hurdler at any distance in Britain and Ireland. It is perhaps surprising given how many times he has run but the handicappers are still unsure about how good he really is, as all of his wins come so easily and the opposition is quickly brushed aside at the business end of the race. No matter what tactics his opponents use Big Buck’s shows himself to be ‘the special one’. His best performance in 2011-12 season was in the Rewards4Racing Cleeve Hurdle where he gave Dynaste (161) 4lbs and a comfortable seven length beating. Perhaps next year we will find out the true level of Big Buck’s ability as Simonsig (160) is the highest rated Novice Hurdler for 6 years. It is not often that a Hurdler wins at Cheltenham and Aintree by a combined total of 22 lengths and he looks sure to improve and give the great Big Buck’s a run for his money.